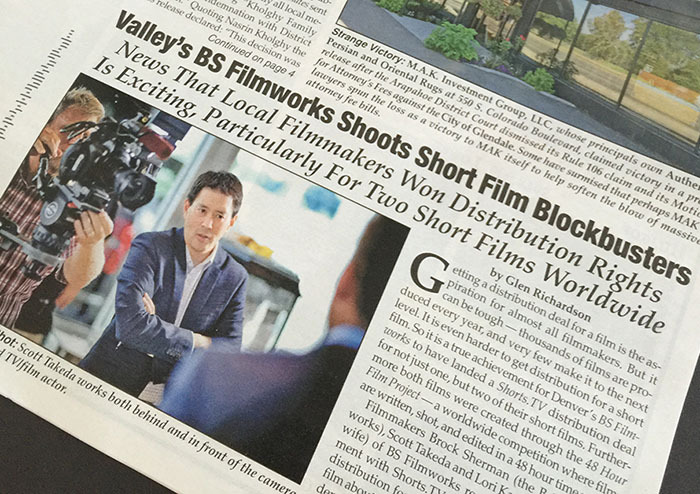 This week, the Glendale Cherry Creek Chronicle did a follow up story on director Scott Takeda and how BS Filmworks got distribution from Shorts.TV. Reporter Glen Richardson wrote: Getting a distribution deal for a film is the aspiration for almost all filmmakers. But it can be tough – thousands of films are produced every year, and very few make it to the next level. It is even harder to get distribution for a short film. So it is a true achievement for Denver's BS Filmworks to have landed a Shorts.TV distribution for not just one, but two of their short films.